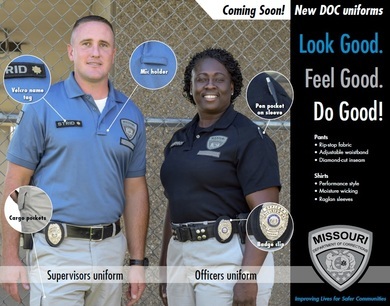 The Missouri Department of Corrections is introducing new uniforms for officers in all adult institutions in early 2019. Designed for comfort and performance, the uniforms pair adjustable-waistband cargo pants made from breathable, rip-stop fabric with performance-style raglan-sleeve shirts — black for COIs and blue for supervisors. Velcro features make for easy laundering. Uniforms will be manufactured through Missouri Vocational Enterprises. Corrections officers and custody supervisors selected and voted on the uniform choices for their peers. Thank you to everyone who contributed design input. Director Anne Precythe and the Office of Personnel help clarify changes to the application and hiring process under merit reform. During Veterans Week and every week, we're grateful for staff who have served our country in the military and our state in corrections. 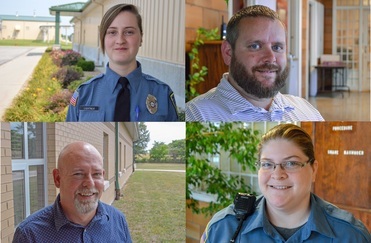 We're also thankful for staff who help incarcerated veterans find support in programs at Boonville, Moberly, Algoa and Potosi correctional centers. 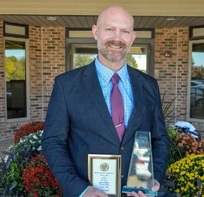 Jason Royle, a corrections training officer at Eastern Region Training Center, is the October 2018 Missouri Department of Corrections employee of the month. Royle is eager to go where he’s needed to make the department stronger. Though assigned to the training center in Farmington, earlier this year, he coordinated and conducted a weeklong Crisis Intervention Team training program at Southeast Correctional Center in Charleston. He even brought snacks. SECC staff are now better equipped to deescalate tense situations and help Missourians facing mental health crises. Probation & Parole Officers Lisa Kelly and Dan Spring of District 8C and Jennifer Bucksath of District 19 have earned the Missouri Department of Corrections Lifesaver Award. Kelly and Spring administered first aid to a woman who had been assaulted in the parking lot and was bleeding profusely, providing care until paramedics arrived. Bucksath dispatched emergency personnel when a client she'd phoned to discuss test results had difficulty speaking and then became unresponsive. The client was hospitalized and placed on a ventilator, and the attending physician told Bucksath her quick action saved the client's life. Governor Mike Parson has named Don Phillips chair of the Parole Board. Elected to the Missouri General Assembly in November 2010, Phillips served as a state representative for Stone County and parts of Christian and Taney counties (District 138), chairing the committee on crime prevention and public safety. Before that, he was a state trooper with the Missouri State Highway Patrol for 28 years. Missouri has one of the fastest-growing populations of female offenders in the United States. The department is working to change that trend through gender-informed practices and post-release support. Beginning in January 2019, Fulton Community Supervision Center will become the state's first DOC-run community release center to serve women. Your great work is making headlines. Check out news media coverage of the department's Puppies for Parole, reentry, restorative justice and performing arts programs as well as efforts to address staffing and salary issues. One of Governor Mike Parson's top priorities is strengthening Missouri's workforce. We're ready to help. As part of our strategic plan, the department has introduced 81 new initiatives, and 55 are focused on staff development and workplace safety. We're working to increase salaries; boost recruitment and retention; improve training; and offer more education opportunities. As the state's largest agency, responsible for 11,200 positions, MODOC is an employment powerhouse. Thanks for all you to do make us stronger. The department is working with Ashland University of Ohio to establish a higher education program for staff and offenders. Ashland plans to offer DOC staff a tuition discount for online degree programs through the College of Online and Adult Studies. Offerings include associate’s, bachelor’s and master’s programs in fields such as criminal justice, business, communications and nursing. Ashland's site director will work with employees pursuing higher education anywhere, helping them complete FAFSA forms and apply for grant or loan funding to attend the college of their choice. 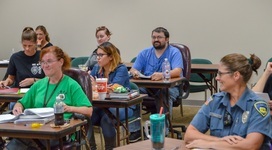 Partnering with Rockhurst University, Washington University and Saint Louis University, the department offers on-site college courses for staff at Chillicothe Correctional Center; Missouri Eastern Correctional Center; and Eastern Reception, Diagnostic & Correctional Center. Courses are provided free of charge to current staff members who work at or travel to the sites where they’re offered. As Missouri faces a critical shortage of workers, staff who support offender training and education help us fill in the gaps. These programs increase employment and reduce recidivism, creating a WIN-WIN-WIN-WIN situation for the state. WIN for employers: Skilled labor. WIN for offenders' families: Stability and income. WIN for communities: Safer Missouri. 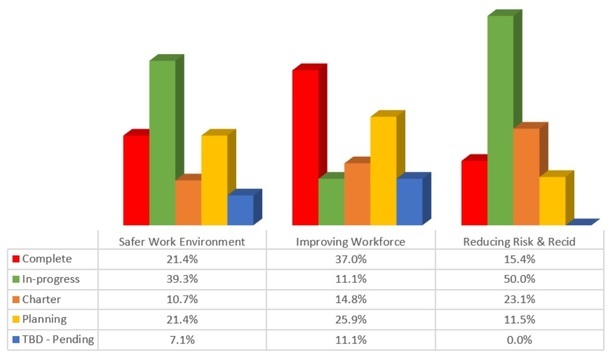 WIN for staff: Smaller prison population. Here are some recent program developments. Computer-based high school equivalency testing for offenders is now available in all facilities. Missouri Vocational Enterprises plans to increase the number of offenders working in MVE factories by 10 percent by the end of 2018, prepping more Missourians to reenter the workforce. We want to make sure everyone is on board and moving in the same direction. So far, about 800 people have viewed the strategic plan online. If you haven't seen it, please take a look: https://doc.mo.gov/about/strategic-plan. Let's keep the conversation going. Want more details? See the progress of our 81 initiatives on the shared drive (K drive) at SHARED_by_All_DOC\Strategic Plan Initiatives. We're working hard to retain staff and to make the Missouri Department of Corrections a great place to work. An essential part being effective in our day-to-day work is cultivating trust among teammates. Be honest and supportive with coworkers. Ask for help, and offer help.